It seems impossible to have a vast and unlimited capacity to keep creating new paintings. Every time I paint, it is almost like I haven’t removed an image from my mind, but instead, actually added more! Each painting results in one or two more ideas I have to get out. At first, it provided me with a goal, as I would finish the painting from the week before, and begin a new one that week as well. I could blog about my finished one, and have one in the works for the next week. A simple formula, and it still works three years later! As a result, I can usually complete between 30-50 paintings a year, depending on size and schedule. You would think that I would eventually run out of things to paint. Not so. As I said before, every painting leads to a new one, another idea, a different color/image/composition/subject. I cannot stop! Nor do I want to. In 2016, I set another goal for myself to improve my work. To get an idea of how to improve, I pinned all my images to Pinterest, then pinned work that I admired on a different board in Pinterest. Side by side, I could see what I didn’t like about my work, what I did like, and how it differed from other’s work. I found that I was going in a direction I did NOT like: doing many little squares, small areas of tiny detail, and too much “noodling”. I also needed larger shapes, larger areas of same-value, and softer edges. Since I have been painting trees in so much of my work, I decided to work on a tree-only series, focusing on these changes. Using my many photographs of local landscapes and trees, I dove in with both feet! This is a real stretch for me, coming from a portrait artist who painted detailed portraits on 140# watercolor paper, believe me, it is a REAL stretch. It is very difficult to change the muscle memory from 20 years of painting detail. Those of you who have attempted this understand the difficulty here. Many aspects of my work remain the same. I continue to use my familiar materials: watercolors and gouache, as well as collage, gesso, and paint on Plexiglas. I continue to texture my Plexiglas heavily, using many items to create interest in the surface of the gesso. Three tree paintings of the new series are below. Again, I focused on using A LARGE brush and softer edges. Less fussing. Grouped values and larger shapes. Can you see the difference from my former work? The Cove-Morning, 18×14 Watercolor and collage on Plexi, one-half of a diptych. 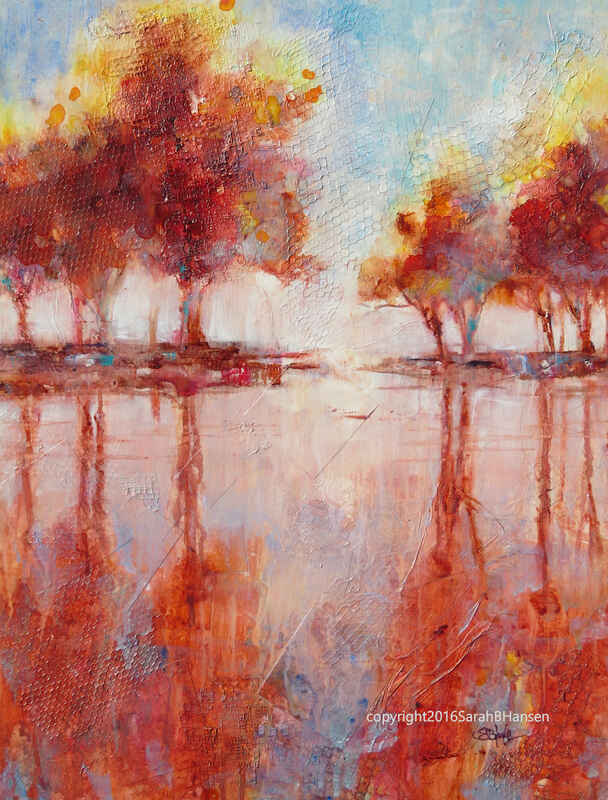 The Cove- Morning, focuses on texture and mood in the reflections of the trees along a lakeside. Each tree has a different texture, and the textures are echoed in the water below. 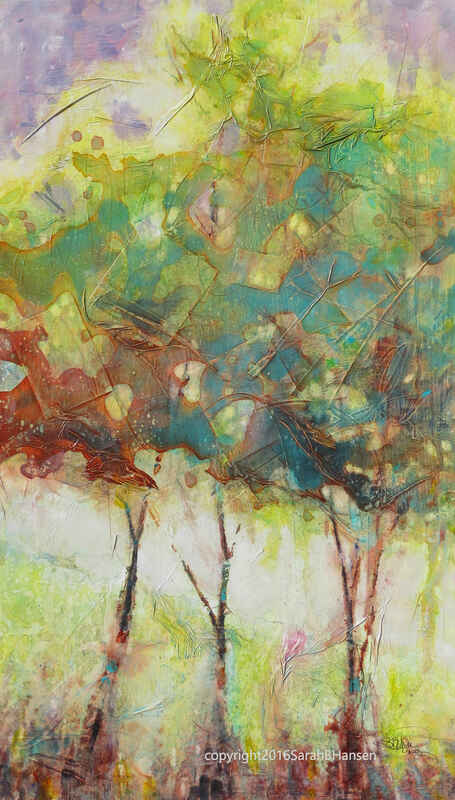 To create the reflection, I poured paint on the surface of the gesso below the trees and let it run down the Plexi, allowing the colors to mix as they dripped. In the second painting, I used a photo I took of aspen saplings in Shevlin Meadows. Afternoon light poured through the trees, highlighting shadows and creating a rim-light effect. Tissue paper collaged in the gesso creates an interesting texture in the painting. I especially love the color palette of this one, with purple and green showcasing three saplings. A small path is highlighted behind the trees, and makes the scene feel a little surreal. Next, I went big with a nice, large grouping of aspen trees. These trees were in Shevlin, as well, but I placed them on the edge of a lake or pond. I created the ground by using a mat board edge, stamping and spreading color with the side. I grouped the colors and values in the leaves to create masses of shapes, rather than individual leaves. I love how the trunks disappear, at times, into the background. In all three of the above paintings, I added white gouache, which is new to me. The white adds an opaque effect that creates another dimension in the work. As you can see, much remains the same in the new work. I believe it has more impact, and is a step in the right direction. 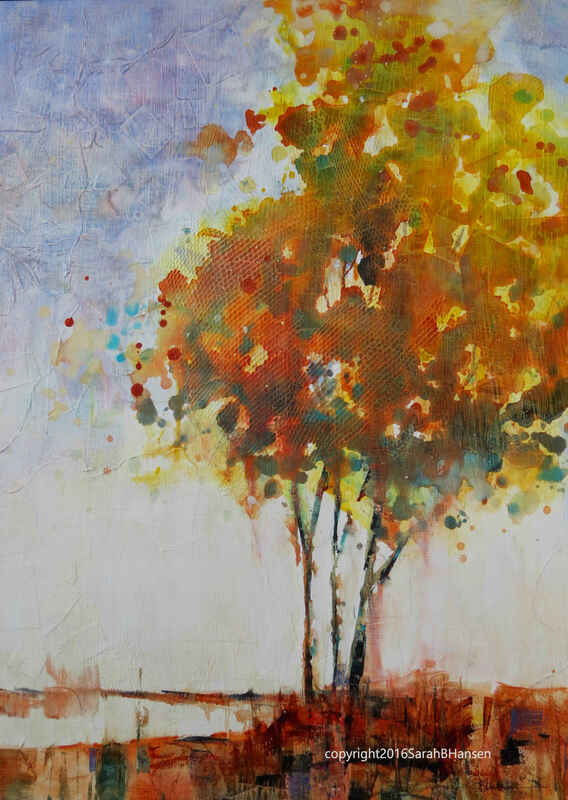 I have many more tree paintings ongoing in my studio, with even more to come. I’ll have some of my new tree series at Tumalo Art Company next week for the month of October. Stop by and check it out. Also, I will be the featured artist at Hood Avenue Art at the end of October through November. Many of my trees will be on display there as well. Write a message and let me know what you think. Can you see a difference? Do you feel the new technique is successful? Follow me on Facebook, Twitter, and Instagram and follow this blog to be informed of amazing new paintings and deals! Contact me to receive my newsletter so that we can meet at showings and to receive notifications about SB Hansen Watercolor & Wine Painting Classes. Every one of my paintings is available as a print, and I sell signed greeting cards of all my images. I love all your work, old and new! Ann Thompson Sent from my iPad. Thank you, Ann!! Maybe I do a tree lesson next class! Wouldn’t that be fun? These are absolutely gorgeous and I do see a difference but I also love the old as well. Thank you, Margaret. I will continue to paint familiar subjects like birds, flowers, and people, but I think this new method of application will add a new dimension to the work! I love your blog, BTW! Hmmmm, how to choose between the to! I love both..
Hello Sarah, I love this tree series!! I love the abstract quality, soft edges, and lightness and I love the different textures that peek out from the colors, I really can feel the mood. Thank you so much! I really appreciate the feedback. Your site is beautiful and creative. Nice work! 🙂 Keep it up! Anytime. I LOVE to see others art and creativity at work! Thank you for your friendship as well. Let’s keep in touch! For a useful friendship, it is necessary to subscribe (to track posts) Comment (to exchange ideas), collaborate and share (to produce) …..
complete a subscription in my blog, to win a gift reserved to subscribers who have a good artistic taste. What a great idea to do with Pinterest. Your work is lovely and evolving in a wonderful way. Thank you. Pinterest is such a great platform to view many different varieties and styles of artwork. We are so lucky to have it at our disposal!